We are dedicated to providing our customers innovative and the best merchandising solutions. For over 25 years, we have been researching, testing, and developing new products and services for their merchandising success. Below lists our patents granted by the United States Patent and Trademark office. A drive-thru magnetic topper is an adjustable support structure for temporary sign displays formed from a vertically oriented rigid panel. Our magnetic graphics can be applied to any ferrous surface and turns vehicles, steel panels, and most metal doors into a new advertising space. Installation and removal of magnetic graphics is easy, allowing you to promote your brand and product quickly. 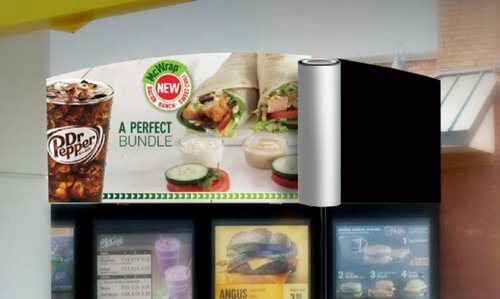 Available with three-dimensional graphics such as our 3D cups, this product creates a disruptive 180° visual in your drive-thru lanes. Easy to apply magnetic system and easy to remove! U.S. Patent #8,660,898 issued in February 25, 2014. Our P.O.P. Placement Program is a system and method of determining point-of-purchase placement locations for printed promotional materials on a retail structure. 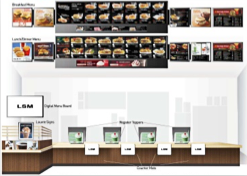 (4) Based on each location's survey data and prioritized promotional messages, our system generates customized merchandising schematics for each location to help create foot traffic and build sales. Used in thousands of McDonald's restaurant locations around the United States today, this P.O.P. Placement Program is our signature product for multi-site retailers. Our dimensional offset system was developed as a solution to replace outdate dimensional system, such as Styrofoam blocks with double-sided tape which can be too bulky to ship and difficult to install. This transforms standard, flat graphics into 3-D designs by providing layered dimensionality for promotional displays. These patented dimensional offset system are custom-made and available in full-color designs with one, two and three-inch offset systems. S2K's patented One-Size-Fits-All Box Signs fits securely over our 4 ft. tall mounting stakes. These box signs can be placed anywhere in your exterior zones, whether it is in your drive-thru, front lawns, parking areas, or your entrance.